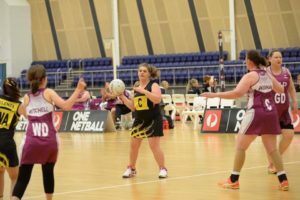 No Limits gives participants with an intellectual disability aged 11 and over the opportunity to engage with netball, meet new friends and play in a safe environment as part of a team. For one No Limits player Grace Pirie, who has cerebral palsy, it was the perfect fit to continue playing the sport she loved when options became limited after finishing school. “It was really hard to find a place, I didn’t play netball for a year since I left school. Mum suggested I try No Limits,” she said. No Limits includes a weekly after school netball training program and taking part in the Smarter Than Smoking Association Championships No Limits Division. Grace’s mother, Simone, said No Limits provided the ideal balance of a safe environment for players with disabilities, without losing its competitive edge on the court. It also gave Grace the chance to become a State Team player, after she was selected in WA’s Marie Little OAM Shield team last year. “Even if she didn’t get in the team just going to the trialling and playing with other girls with disabilities I thought it would give her confidence, fitness and another group of friends,” Simone said. Being involved in No Limits also gave Grace confidence off the netball court. “Thanks to No Limits, Grace realised she could do whatever she wanted to do. This year she’s started a TAFE course doing education support. She wants to work with young children.